1Tropical Medicine & Infectious Diseases, Tanta University Faculty of Medicine, Tanta, Egypt. Background & Aim: Nutritional assessment in cirrhotic patients is difficult because many of the traditionally measured parameters, such as weight, body mass index (BMI) and biochemical values vary with the severity of liver disease independently of nutritional status. The aim of this study was determination of the best available methods for assessment of malnutrition in cirrhotic patients and to evaluate the impact of malnutrition on occurrence of complications in those patients. Methods: One hundred cirrhotic patients were enrolled in this cross sectional study. Nutritional status was assessed by Subjective Global Assessment (SGA), Mini-nutritional assessment (MNA), Controlling nutritional status (CONUT), anthropometry, and dominant hand grip strength (HGS). Statistical analysis was performed using Pearson correlation, Kendall's tau-b and Spearman's rho correlation and Receiver Operating Characteristic(ROC curve) with diagnostic test accuracy measurements(sensitivity, specificity, positive and negative predictive values) using SPSS version 16.0. For all used tests, p<0.05 was considered significant. Results: One hundred patients (57% male) aged 56 ± 10 years, (Child score C 27%, B 51%, A 22%) were included in our study. Using SGA as a reference method of nutritional assessment, there was high prevalence of malnutrition (88%) in our patients. In an attempt to detect diagnostic accuracy of different nutritional assessment modalities using SGA as reference standard, CONUT was an excellent test for detection of malnourished patients (AUC = 0.91, 95% CI = 0.79-1, P value = 0.0001). MNA was also excellent for detection of malnourished patients (AUC = .0.96, 95% CI = 87-1, P value < 0.0001). Handgrip strength was a very good test for detection of malnourished patients (AUC = 0.83, 95% CI = 0.69-0.97, P value < 0.0001). There was a significant increase in degree of decompensation and occurrence of complications with increasing degree of malnutrition. A cut off value of (18.6, 4.5 and 8.5) for HGS, CONUT and MNA respectively were found to be significant in detecting malnourished patients. Conclusions: HGS, CONUT, MNA, and dried BMI are compatible to SGA in diagnosis of malnutrition in cirrhosis. Key message: Handgrip strength (HGS) is the best method to assess the nutritional status of the cirrhotic patients as it is non-subjective, not lab dependant, cheap and easy method with high accuracy. Assessment of nutritional status consists of combination of history, physical examination, laboratory assessment, anthropometrics, and body composition. The BMI is well known anthropometric measure that is basic in assessment of nutritional state of healthy and diseased persons. It is a cheap and convenient objective tool dependent on height and weight. But, presence of cirrhosis and oedema make it non accurate tool as it overestimate the actual body mass. Campillo8 used the "Dry BMI" as a corrected BMI values interpretation according to amount of ascites.8 They considered these values (Dry BMI) as a valid method of nutritional assessment in cirrhotic patients with sensitivity of 90% and specificity of 86% in their studies Campillo8 Campillo9 Using the interpretation values of dry BMI in our study improved the sensitivity of BMI from 17%-89%, but still with 66% specificity. Subjective global assessment (SGA) is the most popular method used in evaluation of nutritional state in hospitalized patients.10,11 The use of the SGA was recommended by the 2006 guidelines of the European Society of enteral and parenteral Nutrition (ESPEN) together with anthropometric analysis and handgrip strength test (HGS) for identifying patients with cirrhosis who are at risk of malnutrition.12 Lacking gold standard nutritional assessment tool in cirrhotic patients renders SGA widely accepted tool for evaluation in such patients despite its limitations in predicting clinical outcomes.13,14 So, our study aimed to identify the most efficient tool to assess nutritional state in cirrhotic patients as well as to evaluate the impact of malnutrition on occurrence of complications in those patients. Our study was designed as a descriptive cross sectional study of 100 patients with cirrhosis, admitted to [removed for blind peer review] starting between June 2016 and February 2017. The diagnosis of cirrhosis was based on the medical history, physical examination, biochemical findings and imaging methods (ultrasound and / or computed tomography).The patients aged 18 years or more with documented liver cirrhosis in a stable hemodynamic condition were invited to enter in our study. Those who accept to share were included. Patients with hepatic encephalopathy grade III-IV, active gastrointestinal bleeding, ongoing alcoholism, sepsis, liver failure, suspected hepatocellular carcinoma (using alpha fetoprotein AFP and / or abdominal ultrasound), chronic diarrhoea, on haemodialysis or with renal failure, patients with chronic debilitating diseases (e.g. DM, T.B) were excluded from the study. The protocol was approved by the ethical committee of [removed for blind peer review.A written informed consent was obtained from all participants in the study. The laboratory data collected included complete blood count (CBC), bilirubin, albumin, prothrombin time (PT), International Normalized Ratio (INR), serum urea, serum creatinine and serum cholesterol; all markers were measured by standard laboratory methods. The ultrasound evaluation included the signs of cirrhosis and portal hypertension. For all patients CTP score was calculated based on clinical examination, laboratory findings and U/S data. Anthropometric measurement: including weight and height BMI was calculated by dividing weight in kg/(height in meters)2. To correct for overweight estimation due to ascites, dry BMI was interpreted to have under nutrition as follow; No ascites, BMI ≤ 22 kg/m2, Mild ascites, BMI ≤ 23 kg/m2, Tension ascites, BMI ≤ 25 kg/m2. Body fat and body water contents were measured using Body composition analyzer (Model: X- contact 350 F, Measurement Range:100-950 ῼ). Based on this evaluation, patients were defined as normal, light, moderate and severe degree of under nutrition. Statistical analysis: The collected data were organized, tabulated and statistically analyzed using Statistical Package for Social Studies (SPSS) version 16. Chicago. SPSS Inc. Categorical data were presented as number and percent while numerical data were presented by mean ± standard deviation for normally distributed data. For skewed data, median and inter-quartile range was used. Association between different parameters and degree of malnutrition was tested using Kendall's tau-b and Spearman's rho correlation to obtain correlation co efficient(r). For evaluation of diagnostic accuracy of different modalities used to test malnutrition in our patients, we perform reservoir operator characteristic (ROC) curve using SGA as the best available reference test. 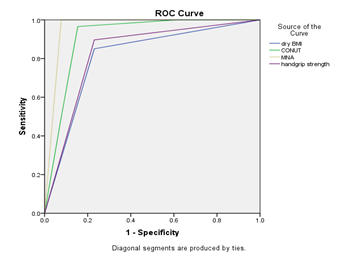 The area under the curve(AUC) with 95%CI were used to get the optimal cutoff values, and sensitivity, specificity, positive predictive value (PPV), negative predictive value (NPV) and test accuracy were calculated accordingly. For all used tests P value <0.05 was considered significant. As SPSS doesn't allow for comparison of ROC curves, we used MedCalc for Windows, version 18.6 (MedCalc Software, Ostend, Belgium) for all pair wise comparison between ROC curves with standard error (SE) calculated according to DeLong et al., 1988. to calculate the Z score. P value <0.05 was considered significant. A series of 100 hospitalized cirrhotic patients, 57 (57%) male and 43 (43%) female, median age 56 (range 18-76 years) were included. The etiology of liver disease was HCV in 97 (97%), one patient had primary biliary cirrhosis and 2 patients had autoimmune hepatitis. Twenty two patients (22%) were classified as Child A, 51 patients (51%) Child B and the rest 27 patients (27%) were Child C.
By clinical examination of the patients it was found that about 57% of them had ascites in the form of mild, moderate, marked and tense ascites, 64% of them had lower limb oedema, 9% had reducible umbilical hernia, 34% were jaundiced, 54% with pallor, 19% had hepatic encephalopathy grade I & II–in whom nutritional assessment was done after recovery from encephalopathy- and 22% had ecchymosis. The biochemical tests and anthropometric measurements of the studied patients were shown in (Table 1). The studied patients admitted to the hospital with infection were 52%(16 patients with chest infection,15 with spontaneous bacterial peritonitis, 9 with urinary tract infection, 3 with typhoid and 9 with cellulitis affecting the lower limbs. Number of malnourished patients according to SGA was 88%, MNA was 88%, CONUT was 95%, handgrip strength was 81%, BMI was 17% and dry BMI was 79% (Figure 1). In an attempt to detect diagnostic accuracy of different nutritional assessment modalities using SGA as reference standard, dry BMI was a very good test for detection of malnourished patients (AUC = 0.81, 95% CI = 0.66-0.95, P value < 0.0001). CONUT was an excellent test for detection of malnourished patients (AUC = 0.91, 95% CI = 0.79-1, P value = 0.0001).MNA was an excellent test for detection of malnourished patients (AUC = .0.96, 95% CI = 87-1, P value < 0.0001). Handgrip strength was a very good test for detection of malnourished patients (AUC = 0.83, 95% CI = 0.69-0.97, P value < 0.0001) (Table 2) (Figure 2). We compared the areas under ROC curves using SGA as classification variable to calculate Z score. The result of pair wise comparison of all ROC curves shows that area under ROC curve was significantly higher for MNA in comparison to HGS (P=0.0189) and dry BMI (P=0.0107). All other tests had comparable area under the curve (P>0.05), (Table 3) (Figure 2). There was a significant positive correlation between degree of malnutrition assessed with Handgrip strength, Dry BMI and presence of infection at time of admission (r= 0.214, 0.212 and P=0.033, 0.035 respectively) while assessment with SGA, CONUT and MNA lacks this correlation (P= 0.225, 0.091, 0.225, 0.237 respectively).There was a significant positive correlation between degree of malnutrition as assessed by scores of CONUT and Handgrip strength and presence of ascites at time of admission (r= 0.190, 0.227 and P= 0.047, 0.024) respectively, while assessment with SGA, MNA and Dry BMI lacks such correlation (P= 0.796, 0.08 and 0.053 respectively)as shown in (Table 4). Considering severity of liver disease, The degree of malnutrition assessed with SGA, CONUT, MNA, Handgrip strength, Dry BMI had a significant positive correlation to Child score (r= 0.479, 0.292, 0.479, 0.478 and 0.484 respectively), significant negative correlation to serum albumin (r= -0.491,-0.756,- 0.491,-0.558,and -0.443 respectively) with P < 0.0001 for them all, but significant positive correlation to INR for the first 3 methods (r= 0.205, 0.205, 0.279 and P= 0.04, 0.005 and 0.04 respectively)and significant positive correlation to total bilirubin for the first 4 methods (r= 0.376, 0.392, 0.376, 0.288 and P= 0.0001, 0.0001, 0.0001and 0.004 respectively) as shown in Table 4. Figure 1 Number of malnourished patients as measured by different modalities of nutritional assessment. Figure 2 Diagnostic accuracy of different nutritional assessment modalities. Our In this study, we aimed firstly to identify the most efficient tool to assess nutritional state in cirrhotic patients. SGA is the most popular method used in evaluation of nutritional state in hospitalized patients.10,11 Considering that there is no gold standard test, we used SGA as a reference test. Using Subjective global assessment (SGA), 88% of our cirrhotic patients were malnourished. This was higher than prevalence reported by Reyes19 (77%) and García-Rodríguez20 (50.9%). This higher prevalence may be attributed to the difference in nutritional habits and lacking regular nutritional evaluation of cirrhotic patients in Egypt. The severity of chronic liver disease, according to the Child–Pugh classification is correlated to their degree of malnutrition.21 This was true for our patients as a significant positive correlation was found between the degree of malnutrition according to SGA and the child score. To overcome the long questioner of SGA, reduced forms were developed. Among them Mini-nutritional assessment (MNA) is the commonest. It is the most-established tool internationally to evaluate nutritional status in older people.7 We had used it to assess nutritional status in cirrhotic patients. It was reported that MNA correlated well with nutritional intake and with anthropometric and biological nutritional parameters in tested individuals.22 According to MNA, it was found that the number of malnourished patients was 88%. In our study MNA was able to detect 100% of SGA diagnosed malnourished patients. It was very useful to get the same results obtained with SGA with shorter and easier tool. Our results were in accordance with Yasutake23 who found MNA equal or better than SGA. The severity of liver disease generally correlates with the severity of malnutrition, and protein-calorie malnutrition correlates with worsening of clinical outcome.24 This was in accordance with our study, results which showed as we find a significant positive correlation between the degrees of malnutrition according to MNA the severity of chronic liver disease, according to the Child–Pugh classification. However, both SGA and MNA had limitations of subjectivity. This is considered a true limitation of the test especially makes the test useless when the patient has some difficulty in reporting their nutritional history adequately.25 This may necessitate the use of more objective tests. Controlling nutritional status (CONUT) is considered to be an objective tool to assess the degree of malnutrition in cirrhotic patients. It has sensitivity of 90% and specificity of 100% for detection of malnutrition in our patients. This was in accordance with García-Rodríguez20 who considered CONUT a very good test to assess degree of malnutrition in cirrhotic patients with sensitivity 75% and specificity 78.57%. Controlling nutritional status (CONUT) was an objective test, relatively cheap, had no sophisticated parameters, easily performed and interpreted. All these factors added to its high accuracy render it a very useful tool in assessment of male nutrition in our patients. Figueiredo28 suggested that screening for body cell mass (BCM) depletion and attenuated muscle function can be measured by Hand grip strength (HGS). 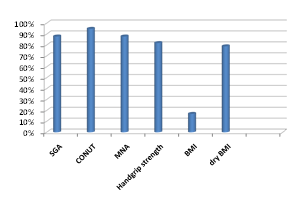 In our study, handgrip strength measurement was a very good test for detection of malnourished patients with sensitivity 100% and specificity 64% at cut off value 18.6 kg when compared with SGA. This was in accordance with Daphnee29 who considered HGS a reliable, non-invasive and cost-effective tool to identify malnutrition in cirrhotic patients at cut off value19.5 kg with sensitivity and specificity 67% and 75% respectively. The difference in cut off value of this study and our results may be due to difference in type of handgrip dynamometer used, as Daphnee used Hydraulic Hand Grip Dynamometer while we used portable handgrip Dynamometer. In our study, the presence of malnutrition as assessed by HGS was positively correlated to severity of chronic liver disease. Similar results were obtained by Sharma32. It was also associated with increased incidence of infection. This was in accordance with Johnson et al who stated that HGS can predict complications like infection better than the BMI and the SGA.33This may be attributed to the augmented effect of cirrhosis and infection which both produce sarcopenia with subsequent weakness of handgrip strength. This explanation is supported by Reid34 who stated that Infection affects muscle metabolism (inflammatory cytokines and endotoxemia results in increased muscle proteolysis) which resulted in muscle weakness. Handgrip strength is objective, cheap, easy to perform, does not necessitate skilled personnel, and lastly it is considered another quantitative method to assess malnutrition. So, in conclusion, in our study; using SGA as reference standard: MNA, CONUT, and handgrip strength were the best alternative tests to be used in cirrhotic patients. BMI was not accurate, but using the interpretation values of dry BMI increased its accuracy. There was strong association between the degree of malnutrition and the degree of decompensation. However, this study has some limitations. The sample size was small, the study was conducted on a selected group of patients with cirrhosis limiting its generalizing ability to all cirrhotic patients especially those with grade III and IV hepatic encephalopathy. We recommend the use of Handgrip strength (HGS) to evaluate the nutritional status of the cirrhotic patients as it is non-subjective, not lab dependant, cheap and easy method with high accuracy. O’Brien A, Williams R. Nutrition in end-stage liver disease: principles and practice. Gastroenterology. 2008;134:1729–1740. Cheung K, Lee SS, Raman M. Prevalence and mechanisms of malnutrition in patients with advanced liver disease, and nutrition management strategies. Clin Gastroenterol Hepatol. 2012;10:117–25. Alvares-da-Silva MR, Reverbel da Silveira T. Comparison between handgrip strength, subjective global assessment, and prognostic nutritional index in assessing malnutrition and predicting clinical outcome in cirrhotic outpatients. Nutrition. 2005;21:113–117. Merli M, Lucidi C, Giannelli V. Cirrhotic patients are at risk for health care-associated bacterial infections. Clin Gastroenterol Hepatol. 2010;8:979–985. Matos C, Porayko MK, Francisco-Ziller N, DiCecco S. Nutrition and chronic liver disease. J Clin Gastroenterol. 2002;35:391–397. Cornier MA, Després JP, Davis N, et al. Assessing adiposity: a scientific statement from the American Heart Association. Circulation. 2011;124:1996–2019. Bauer JM, Kaiser MJ, Anthony P, Guigoz Y, Sieber CC. The Mini Nutritional Assessment—its history, today's practice, and future perspectives. Nutr Clin Pract. 2008;23:388–396. Campillo B, Richardet JP, Bories PN. Validation of body mass index for the diagnosis of malnutrition in patients with liver cirrhosis. Gastroenterol Clin Biol. 2006;30:1137–1143. Campillo B, Preedy VR, Lakshman SR, Srirajaskanthan R, Watson RR. Assessment of Nutritional Status and Diagnosis of Malnutrition in Patients with Liver Disease. Nutrition, diet therapy, and the liver, Taylor & Francis Group CRC, Boca Raton, 2010:33–36. da Silva Fink J, Daniel de Mello P, Daniel de Mello E. Subjective global assessment of nutritional status—a systematic review of the literature. Clin Nutr.2015;34:785–92. Correia MI, Perman MI, Waitzberg DL. Hospital malnutrition in Latin America: A systematic review. Clinical nutrition. 2017;36: 958–967. Plauth M, Cabré E, Riggio O, Assis-Camilo M, Pirlich M, Kondrup J. ESPEN guidelines on enteral nutrition: liver disease. Clin Nutr. 2006;25:285–294. Tai ML, Goh KL, Mohd-Taib SH, Rampal S, Mahadeva S. Anthropometric, biochemical and clinical assessment of malnutrition in Malaysian patients with advanced cirrhosis. Nutr J. 2010;9:1–7. Pérez-Reyes E, Rivera-Sánchez J, Servín-Caamaño AI, Pérez-Torres E, Abdo-Francis JM, Higuera-de la Tijera F. Malnutrition is related to a higher frequency of serious complications in patients with cirrosis. Rev Med Hosp Gen Méx. 2016;79:11–6. Makhija S, Baker J. The Subjective Global Assessment: a review of its use in clinical practice. Nutr Clin Pract. 2008;23:405–409. Kaiser MJ, Bauer JM, Ramsch C, et al. MNA-International Group. Validation of the Mini Nutritional Assessment short-form (MNA-SF): a practical tool for identification of nutritional status. J Nutr Health Aging. 2009;13(9):782–788. Roberts HC, Denison HJ, Martin HJ, et al. A review of the measurement of grip strength in clinical and epidemiological studies: towards a standardised approach. Age Ageing. 2011;40:423–429. Ulíbarri J, Madroño G, de Villar N, et al. “CONUT: a tool for controlling nutritional status. First validation in a hospital population, NutricionHospitalaria 2005;20:38–45. Reyes PE, Sánchez RJ , Caamaño SA, Pérez-Torresa E, Abdo-Francisa JM, Higuera-de la Tijeraa F. Malnutrition is related to a higher frequency of serious complications in patients with cirrhosis. Revista Médicadel Hospital General de México. 2016;79:11–6. García -Rodríguez MT, López-Calviño B, Piñón-Villar MDC, et al. Concordance among methods of nutritional assessment in patients included on the waiting list for liver transplantation. J Epidemiol. 2017;27(10):469–475. Mendenhall CL, Roselle GA, Gartside P, Moritz T. Relationship of protein calorie malnutrition to alcoholic liver disease: a re-examination of data from two veteran administration cooperative studies. Alcohol Clin Exp Res. 1995;19:635–641. Du H, Liu B, Xie Y, et al. Comparison of different methods for nutrition assessment in patients with tumors. Oncology Letters 2017;14(1):165–170. Yasutake K, Bekki M, Ichinose M, et al. Assessing current nutritional status of patients with HCV-related liver cirrhosis in the compensated stage. Asia Pac J Clin Nutr. 2012;21(3):400–405. Panagaria N, Varma K,Nijhawan S, Rai RR. Nutritional status and quality of life at varying degrees of clinical severity of chronic liver disease". Nutrition & Food Science 2010;40:581–590. Aidos MED, Fernandes SA, Nunes FF, et al. One-year follow-up of the nutritional status of patients undergoing liver transplantation. Nutr Hosp. 2016;33:8–13. Cholongitas E, Papa theodoridis GV, Vangeli M, Terreni N, Patch D, Burroughs A. Systematic review: the model for end-stage liver disease–should it replace Child-Pugh's classification for assessing prognosis in cirrhosis? Aliment Pharmacol Ther. 2005;22:1079–1089. Taniguchi E, Kawaguchi T, Otsuka M, et al. Nutritional assessments for ordinary medical care in patients with chronic liver disease. Hepatol Res. 2013;43(2):192–199. Figueiredo FA, Dickson ER, Pasha TM, et al. Utility of standard nutritional parameters in detecting body cell mass depletion in patients with end-stage liver disease. Liver Transpl. 2000;6:575–581. Daphnee DK, John S, Vaidya A, Khakhar A, Bhuvaneshwari S, Ramamurthy A. Hand grip strength: A reliable, reproducible, cost-effective tool to assess the nutritional status and outcomes of cirrhotics awaiting liver transplant. Clinical Nutrition ESPEN. 2017;19:49–53. Matos C, Porayko MK, Francisco-ZillerN, DiCecco S. Nutrition and chronic liver disease. J Clin Gastroenterol. 2002;35:391–397. Huisman EJ, Trip EJ, Siersema PD, van Hoek B, van Erpecum KJ. Protein energy malnutrition predicts complications in liver cirrhosis. Eur J Gastroenterol Hepatol. 2011;23:982–989. Sharma P, Rauf A, Matin A, Agarwal R, Tyagi P, Arora A. Handgrip Strength as an Important Bed Side Tool to Assess Malnutrition in Patient with Liver Disease. Department of Gastroenterology, Sir Ganga Ram Hospital, New Delhi, India. 2017;7(1):16–22. Johnson TM, Overgard EB, Cohen AE, DiBaise JK. Nutrition Assessment and Management in Advanced Liver Disease. Nutr Clin Pract. 2013;28(1):15–29. Reid WD, Rurak J, Harris RL. Skeletal muscle response to inflammation-lessons for chronic obstructive pulmonary disease. Crit Care Med. 2009,37(10):372–83. ©2018 Magdy et al. This is an open access article distributed under the terms of the Creative Commons Attribution License , which permits unrestricted use, distribution, and build upon your work non-commercially.